WASHINGTON (AP) -- President Barack Obama on Wednesday will buck Republican opposition in a defiant display of executive power and name a new U.S. chief consumer watchdog. Outraged Republican leaders in Congress suggested that courts would determine the appointment was illegal. More than a standoff over one significant appointment, the fight speaks to the heart of a presidential campaign under way. Presiding over a troubled but improving economy, Obama's must persuade a weary American middle class that he is their advocate, while fending off criticism from Republicans challengers and lawmakers. With a director in place, the new Consumer Financial Protection Bureau can start overseeing the mortgage companies, payday lenders, debt collectors and other financial companies often blamed for practices that helped tank the economy. The president planned to highlight just that point during his announcement later Wednesday in Ohio that he was putting Richard Cordray in the job. It seems certain to raise the level of confrontational politics for a president seeking re-election by championing the middle class. Acting right after Tuesday's Republican presidential caucuses in Iowa, Obama is seeking to grab attention with his most brazen leap-frog over Congress and show that criticism will not slow him. 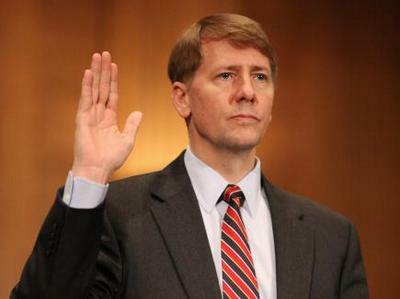 Republicans have stalled Cordray's nomination because they think the consumer agency is too powerful and unaccountable. The Senate's top Republican, Sen. Mitch McConnell, accused Obama of an unprecedented power grab that "arrogantly circumvented the American people." Added the Republican leader of the House, Speaker John Boehner: "It's clear the president would rather trample our system of separation of powers than work with Republicans to move the country forward. This action goes beyond the president's authority, and I expect the courts will find the appointment to be illegitimate." By his move, Obama essentially is declaring the Senate's short off-and-on legislative sessions a sham intended to block his appointments. Yet it was his own Democratic party that started the practice. The White House braced for fallout, but said Obama was left with little choice to get the consumer agency fully running after months of stalemate. White House communications director Dan Pfeiffer announced Obama's move on Twitter after senior administration officials first confirmed it to The Associated Press. Obama planned to talk about his decision at an economic event in Cordray's home state of Ohio, accompanied by Cordray. Cordray would take over the job later in the week and stands to serve for at least the next two years, covering the length of the Senate's session. Obama planned to say that every day Cordray waited for confirmation, millions of people remained unprotected from dishonest financial practices, according to prepared remarks obtained by the AP. "That's inexcusable," Obama says in the remarks. "And I refuse to take 'No' for an answer. I've said before that I will continue to look for every opportunity to work with Congress to move this country forward. But when Congress refuses to act in a way that hurts our economy and puts people at risk, I have an obligation as president to do what I can without them." Obama has constitutional power to make appointments during a congressional recess. Expressly to keep that from happening, Republicans in the Senate have had the Senate running in "pro forma" sessions, meaning open for business in name with no actual business planned. Democrats started the practice when George W. Bush was president to halt him from making recess appointments. The Senate held such a session on Tuesday and planned another one on Friday. Republicans contend Obama cannot make a recess appointment during a break of less than three days, based on years of precedent. The Obama White House contends such an approach is a gimmick. For all practical purposes, the Senate is in recess and Obama is free to make the appointment on his own, administration officials told the AP.